Early to mid summer. Reblooms if deadheaded. Like all campanulas quite easy. Divide if clumps become too large. Cut back after flowering for tidiness. Peach Leaf Bellflower is another lovely member of the Campanula genus. It reaches 2 to 3 feet high and has showy spikes of bell-shaped flowers in summer. Both blue and white types are available. This is an excellent choice for a mixed border and is very attractive planted in groups or drifts. It also performs well as a cut flower. 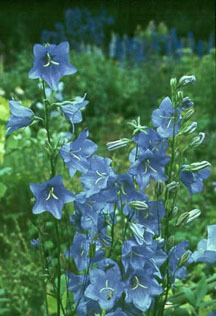 Like all campanulas, Peach Leaf Bellflower is a relatively easy specimen with few pest or disease problems. It will tolerate a wide range of soils though extremes (either very dry or soggy) should be avoided. Flowering is best in full to part sun. Dividing plants every third or fourth year will maintain vigor. Look for die out in the clump center as a sign that division is needed. This is best done in early spring. Space new plants 12 to 18 inches apart.